It is our tradition to pay close attention on the feedback the first-hand consumers give regarding a product. Coupled with our own experience, we find adequate evidence to support or dispute a decision of buying an appliance. We have employed both approaches in examining and re-examining this best pellet smoker and our suggestion is "YES". 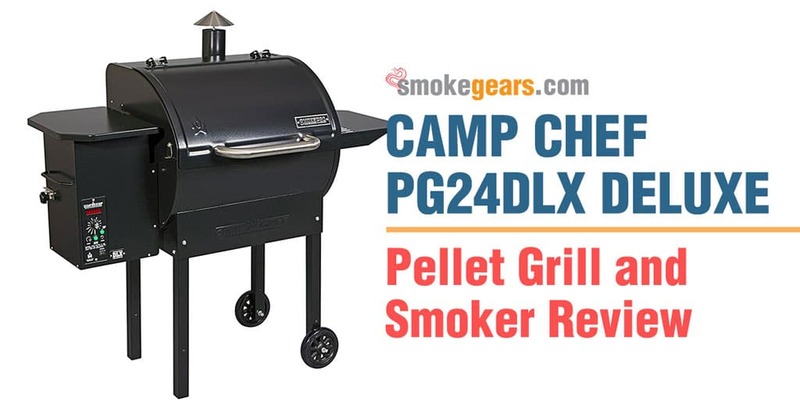 Now you can go for this Camp Chef PG24DLX Deluxe Pellet Grill and Smoker with no worries because it is highly rated and positively reviewed. Looking at its price, you may be fooled when you compare with a smoker like Masterbuilt. It is until you compare with other models of pellet smokers that you will realize how cost-effective it is. Therefore, buying the best pellet smoker entitles you to a huge discount you will never get anywhere else. This is an advanced smoker and grill which obviously constitutes excellent features that are nowhere to be found in ordinary smokers. Its operational mechanism is close to a digital smoker, featuring the most advanced digital control. The Automaticity of this smoker also includes the auger feed pellets into the grill. This results in excellent temperature maintenance as well as smoke optimal smoke production. Your task in using this smoker is just to set it and let it grill. Say bye to babysitting. This unit is so versatile that it performs grilling, smoking, baking, roasting, braising and barbequing, all resulting into excellent food. Depending on the exact type of food you are preparing, you have a wide range of temperature to set your optimal. As your food cooks, you can constantly monitor the temperature using the meat probe thermometer. The total surface area for cooking amounts to 579 square inches which allows you to cook more than enough food. Whether you are planning to purchase one for home or commercial purposes, this model suits you. Using this Camp Chef PG24DLX Deluxe Pellet Grill and Smoker BBQ is not complex despite its complex features. For instance, the upper warming rack is removable and this makes the smoker convenient. Convenience is further enabled by the patented ash clean-out which eases up the process of cleaning. People whose priorities are convenience: Convenience of this smoker is in its ability to automate cooking processes as well as easy-to-clean feature. If you are fed up with your present or past equipment, this is a special substitute for you. It has the potential to fulfill all your desires. People who are carry out multiple types of cooking: As already mentioned above, this equipment performs grilling, smoking, baking, barbequing among other tasks. If you are not specific on your regular tasks, this versatile equipment keeps you on the safer side. Better order for it and avoid uncertainties and other cost implications. Busy people: Regardless of your career, the nature of your job determines whether you are a busy person or not. Certainly, most of us are busy with tight schedules on daily basis. Babysitting throughout the cooking process may eat substantially into your time. However, purchasing this great pellet smoker enables you to benefit from “set it and leave it feature”. Restaurant owners: If you own a restaurant or any other eating place, the best pellet smoker has the potential to transform your business. It is highly recommended for the preparation of restaurant food because the quality of its outcomes is a guarantee. All pellet smokers are excellent in design and functioning. This is not just a presumption but a fact that has been tested and found true. Because this Camp Chef PG24DLX pellet grill is one of the cost-friendly among the pellet smokers, many customers have already tested it. In so doing, we have been following up closely to see how every consumer experience the product. Our findings have simply been a confirmation of what is said everywhere about the best pellet smoker. The best stars rating accorded to this product on Amazon is a backup to the product quality. Most off the buyers who have rated the product quality highly, it is not possible that the product can be a scam. Apart from the reviews and ratings, we have had first-hand experience with this pellet smoker. Our product was shipped from China and it arrived safely, although some complains regard its safety during delivery. We identified its lightweight feature both as an advantage and a disadvantage. It is an advantage because it makes the smoker easy to handle and use. On the other hand, it is a disadvantage because it makes the lifespan of the smoker a little bit shorter. Nevertheless, with utmost care, the smoker is worth your money. It is an inexpensive type of pellet grill. Built-in meat probe ensures utmost certainty while smoking or grilling. Though large in size, it is easy to transport because of the lightweight feature. Lid is too thin and often fails to line up. Lightweight construction reduces lifespan. Generally, the price at which this smoker sells is not bad for its functionality. Compared to other pellet smokers, this is simply a great bargain. Despite its lower price, it is still a functional smoker. This camp chef pellet grill and smoker is widely recognized for its versatile nature and ample cooking space. Because of convenience, busy people and those whose desire is to achieve quality results are potential users of this smoker. It is highly rated and positively reviewed hence associated with great results. If you have to purchase the best pellet smoker, choosing Camp Chef PG24DLX Deluxe Pellet Grill and Smoker BBQ is the best decision you can make. Order from Amazon today.